A concentrated water based cleaner low in odour, non-flammable and biodegradable. Devprep 88 is ideal for cleaning intact painted surfaces in preparation for repainting. It is also useful in cleaning rusted steel, galvanized metal, and masonry surfaces. It is particularly useful for cleaning dirty, greasy concrete floors, walls, machinery, and e..
A concentrated water based cleaner low in odour, non-flammable and biodegradable. 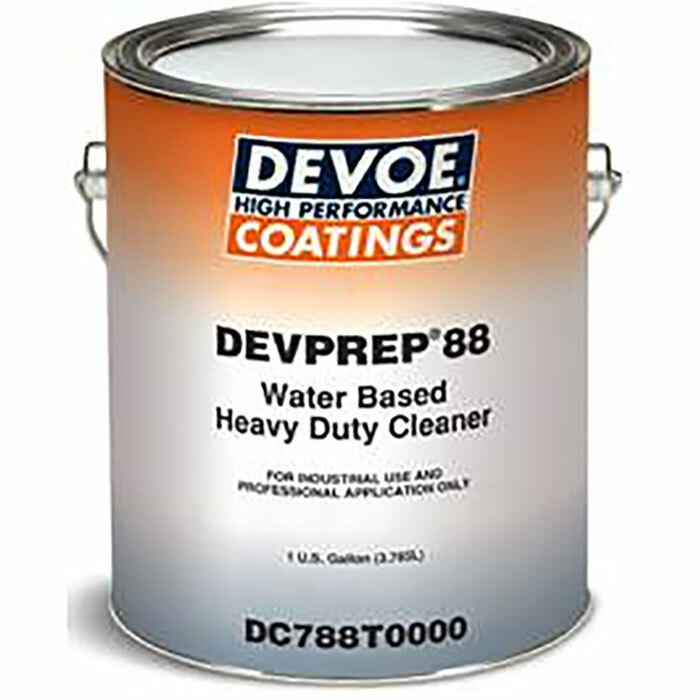 Devprep 88 is ideal for cleaning intact painted surfaces in preparation for repainting. It is also useful in cleaning rusted steel, galvanized metal, and masonry surfaces. It is particularly useful for cleaning dirty, greasy concrete floors, walls, machinery, and equipment in industrial and commercial environments. Devprep 88 can also be used to clean aluminium, galvanized and other surfaces prior to painting. Also effective, prior to abrasive blasting or application of wetting primers, to remove grease, oil, chlorides or other contaminants.